A bit of a ramble below, you can just look at the picture, if you prefer. Ha, ha. For the Tailwind Nutrition 3 Marathons in 3 Days, there is always a change you can get lost. HOWEVER, the course is marked at all intersections. Some sections have no signage, but that is because there is nowhere to go wrong, you just stay on the path you are on! 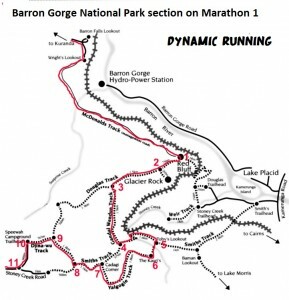 For those who do get lost, the most common response is that they will be reading the course description and studying the maps provided before they do another trail race. The problem we have is that the locals think they are doing us a favour by removing the signs and returning it to us. And we go – ‘But the race has not taken place yet!’ To prevent this, we have a notice at each intersection informing other track users of the date of the event. We also delay setting up the course signage until about 4 days prior to the race. You will receive a map each day, and if you get to an intersection without signage, you will have to get your map out and look where you are, or wait for another competitor to come along. We had a runner go off course on Day 1 a couple of years ago, and lucky for her she got mobile reception (a miracle really!) and phoned us. She could give use her location as she was at an intersection and they are all numbered. It was not on her map, as she was actually on the Day 2 course! SES went out and got her and all worked out okay. It’s worth your time reading over the descriptions for each day and keeping track of the distances you cover between intersections so you can pin point where you are. There is no ‘navigation’ required as such, you are told exactly where to go each day. 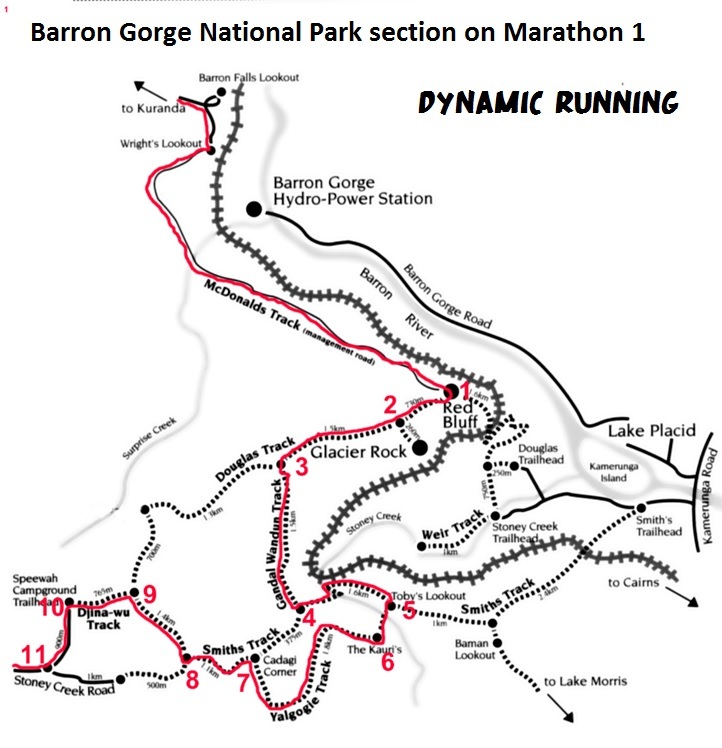 The first day in the Barron Gorge National Park section can be the most confusing as there are signs directing you to Speewah Campground (runners have gone wrong here and took the ’emergency exit option!’), but you hav e to follow the course – which still takes you to Speewah Campground, but the long (hard!) way. There is a close up map to help the runners with that section. If you are in Cairns, a good way to get some confidence in the event is to join us for our FREE training trail runs over the course leading up to the event. Details on our website under ‘Trail Running‘.